An elegant pair of two-candle wall sconce lights from the 1920's have original "smoke" colored crystal European cut prisms and arms. There is one clear prism and the oval back plates have an antique tarnished patina, see photos. 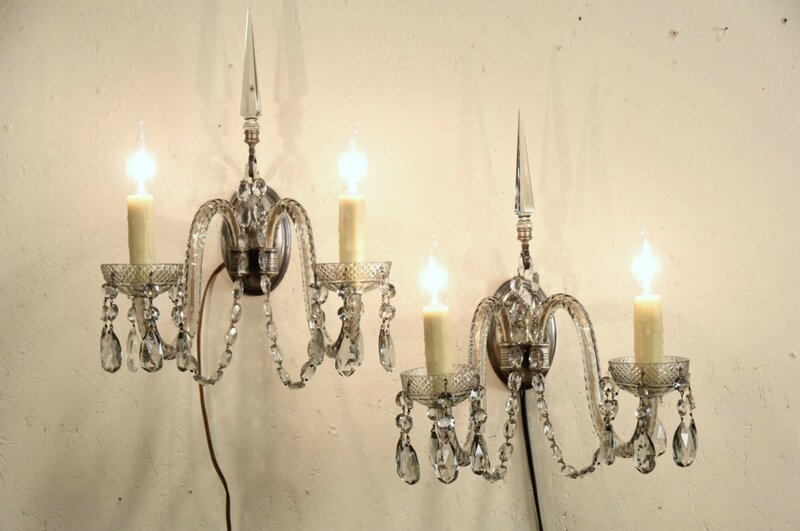 Both double sconces have been rewired, drip candle covers are beeswax. American made lighting, these historic fixtures can be mounted on electric outlets on the wall, or fitted with extension cords as shown using the original wall mounting brackets. Size is 13" wide, 18" tall and projection is 10" from the wall.